Getting your finances in order can be a point of contention for couples trying to buy a house. There are a number of experiences that will test any relationship, and buying a home ranks right up there. From getting qualified for a mortgage to closing the deal, the homebuying process is sometimes unpredictable and often stressful. The road to buying a new home can be bumpy, but the destination is well worth it. 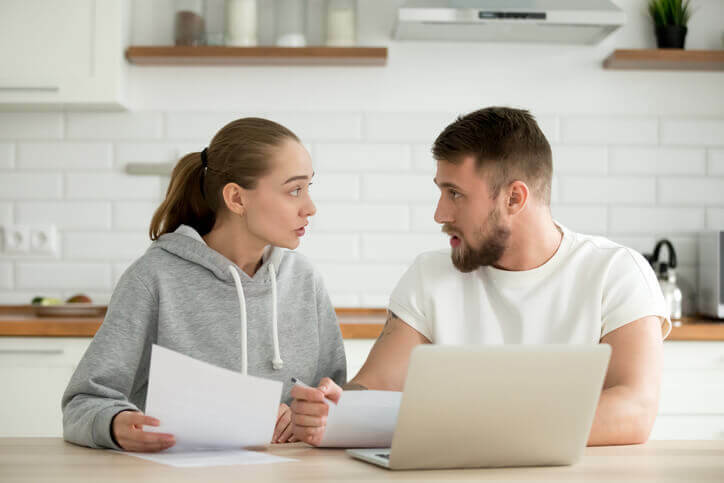 Below are five reasons the homebuying process can cause tension between you and your partner—and our advice to help you stop an argument before it starts. 1. Your affairs aren’t in order. No, not those kinds of affairs. We’re talking about your financial affairs. When you buy a house, every aspect of your finances will be poked, prodded and probed down to the last penny in your checking account. Lenders want to make sure you can afford the house you want to buy, and it’s your responsibility to prove you can. Gathering all the required paperwork — bank statements, tax returns, pay stubs and so on — is a daunting process that can fray anyone’s nerves. Our advice: Work together and stay calm even when your partner can’t find that one vital file. Be open about your financial history; it’s not fun to fess up to that credit card debt you ran up, but wouldn’t you rather your partner found out from you than from your lender? 2. You haven’t determined your budget. Just because you qualify for a certain mortgage doesn’t mean you have to take the entire thing. While your lender will consider your debts and income, only you and your partner truly know how much you can afford to pay each month. Your lifestyle may change quickly, especially if one of you is looking to make a career change or you’re about to start a family. Without a solid budget in mind, you and your partner may be setting yourselves up for disappointment—and arguments. Our advice: Take the time to do the math and come up with a hard and fast figure you can’t exceed. It’s important to consider both your present situation and your long-term plans when you’re looking for a new home. 3. You haven’t identified a main point of contact. In today’s hot market, things often move quickly. Your lender needs all your paperwork yesterday. Your Realtor needs to know now if you’re going to make an offer on that house you just saw. When you do make that offer, you have to be ready to respond to a counteroffer before another buyer swoops in and says they’ll pay cash. There’s no time for miscommunication. You and your partner must be on the same page at all times and trust each other. It’s a good idea to plan for every scenario as much as possible and identify which one of you will be on standby as the process unfolds. Our advice: Before you start the homebuying process, decide who will be the main point of contact with your lender and Realtor. You’re a team—but every team needs a coach who can make the tough calls. 4. You don’t know what you want. There are a lot of houses out there and a lot of factors to consider. If you don’t have an idea of what you’re looking for, you’ll quickly get overwhelmed. Buying a house is time-consuming and stressful enough without wasting your partner’s or your Realtor’s time by looking at houses you’d never, ever consider. Our advice: Sit down with your partner and make a list of non-negotiables that you both agree on. Keep it as short as you can, but be realistic. You don’t want to let your partner talk you out of something you really want and end up feeling resentful. 5: You do know what you want — and you’re not willing to budge. Sure, you want the perfect house in the perfect neighborhood at the perfect price. Don’t we all? Unfortunately, there’s a reason people in the industry call those unicorn houses: They don’t exist. That doesn’t mean the perfect home for you and your partner isn’t out there; it just means you have to keep your expectations in check. Our advice: Be flexible and listen to your partner and your Realtor. You may need to consider a longer commute or a smaller backyard. Through careful planning and open, considerate communication, you and your partner soon will be settling into a house you will love for years to come.